Italian firearms manufacturer Franchi hasn’t received a lot of attention in the pages of RifleShooter, and there’s an obvious reason for that: the company never offered a rifle in its catalog. 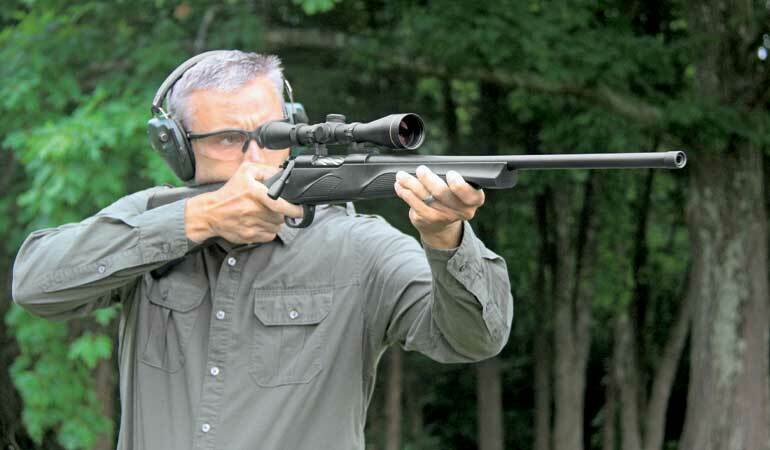 But that all changed in 2018 when the company, which is best-known for its Inertia Driven Affinity shotguns and fine stackbarrels, launched its first-ever budget bolt-action centerfire: the Momentum. The budget hunting rifle market is a tough arena, especially since there are so many accurate, affordable bolt guns on the market today. The Momentum has to prove it’s going to win fans from the likes of Savage, Winchester, Ruger, Browning, Remington, Thompson/Center and the host of other manufacturers with names that rifle shooters weren’t learning to properly pronounce (it’s a hard “ch” sound, as in “chemistry,” just so you know). But my initial look at the Momentum impressed me, and not surprisingly, I found the engineers at Franchi had done their homework. Sure, the Franchi Momentum has its share of stylized features, such as an unconventional textured section just ahead of the magazine, a raking fore-end that seems to pay homage to the Affinity semiauto shotguns and a narrow cutout just aft of the recessed rear sling stud for gripping the rifle when shooting off bags at the range. After all, this gun does hail from the land of Giorgetto Giugiaro, who designed so many Ferrari and Maserati cars. The Momentum sports a fluted three-lug bolt and a nicely proportioned ejection port. It feeds from an internal box magazine with hinged floorplate. But more important than the aesthetics are the internals, and Franchi based the Momentum around a push-feed action featuring a full-size, chrome-finished fluted bolt body with three locking lugs up front. The sporter-contour barrel is cold-hammer-forged and free-floated and comes with a threaded muzzle with an end cap (you can opt for the rifle without a threaded muzzle if you prefer), and the trigger is user-adjustable from two to four pounds. 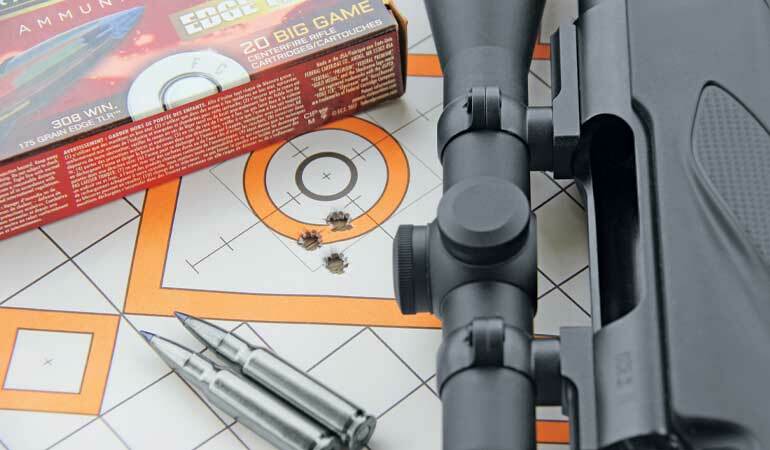 There’s no need to purchase scope bases because the Momentum comes with a pair of Weaver-style bases, but if you prefer something else, the receiver is drilled and tapped to accept Remington 700 bases. The bluing on this rifle’s metalwork is rich and glossy, and the synthetic stock is light and durable. There’s a hinged floorplate, an enclosed bolt shroud with a prominent cocking indicator that you can see and feel and a two-position safety that allows the bolt to be operated in Safe condition. Additionally, Franchi backs the Momentum with the same seven-year warranty the company offers on its shotguns. The Momentum’s fat bolt design reduces slop during cycling, so operation is fast and smooth. The three-lug design keeps bolt lift to a minimum—just 60 degrees—and the rather thin bell-shaped bolt knob is relatively small but easy to grasp and manipulate. There’s a plunger-style ejector, and the large, easy-to-operate bolt release on the left side of the receiver is easy to find and manipulate. The Momentum’s short bolt lift and bolt knob design are particularly beneficial when shooting from the bench. While I was testing the Franchi, I was also sighting in an older rifle that incorporated a two-lug design, and the Momentum was much faster and easier to run from the bench—where many shooters spend the bulk of their trigger time—because the bolt need only be lifted to the height of the bore. The sling swivel “studs” are recessed into the synthetic stock and paired with a stylish spot of texturing. The pad is Franchi’s TSA, which promises to cut felt recoil in half. It’s a minor thing, yes, but after an hour on the range with both types of rifles, you’ll begin to truly appreciate the Franchi’s design. 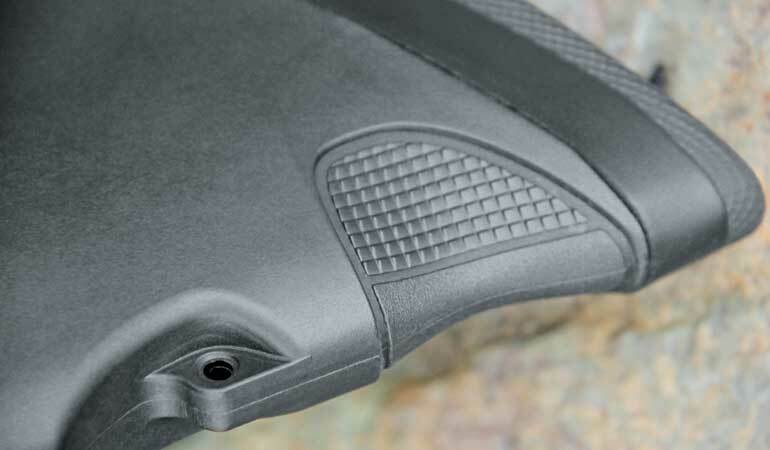 Speaking of range time, the raised, textured grip surface just ahead of the magazine offers a natural hold point when shooting the rifle from a bag or a sled. It’s a bit quirky but functional, and it’s a signature adornment that makes the Momentum instantly recognizable. I was a little surprised to see that Franchi opted to add a hinged floorplate to the Momentum. In a world seemingly dominated by detachable box magazines, hinged floorplates are not as commonly seen on new rifles, and part of the reason for this is the trend toward receivers with small ejection ports. If you’ve ever tried to top-load more than one cartridge through those minimized ejection ports, you understand how frustrating it can be. As someone who started shooting with Model 700s, Ruger 77s and Winchester Model 70s, the top-load design is natural. The release for the hinged floorplate is located inside the trigger guard, so there’s less chance you’ll accidentally bump it and drop the contents of your magazine. While the Momentum doesn’t offer as much space for top loading as, say, a Remington 700, most shooters should be able to effectively load the rifle. The cartridges seat well in the magazine, although there were a few instances when I had to realign a round so it stacked neatly, which was generally the result of loading too far forward. The impetus behind minimizing the size of the ejection port is to create a more rigid receiver and promote accuracy, but the Momentum didn’t suffer from problems in that department. Franchi lists the Momentum’s weight at 6.6 pounds, unloaded and unscoped. With a Leupold VX-2 3-9x40 scope mounted on Leupold dual dovetail rings and loaded with a maximum of five rounds of ammunition, the Momentum I tested weighed almost exactly eight pounds—light enough to carry on long hikes through steep country but not unpleasant to shoot. Franchi’s TSA recoil pad, which is found on its shotguns, is incorporated into the Momentum rifle. Although I can’t substantiate or deny Franchi’s claim that these recoil pads reduce kick by as much as 50 percent, I can assure you that this comfortable pad makes this a comfortable rifle to shoot. That’s no surprise, considering it’s the same technology the brand uses to make its relatively light 3.5-inch 12-gauge shotguns manageable to shoot. The initial prototype rifle I examined seemed to have a relatively heavy trigger with some take-up, but this wasn’t the case with the production sample I received. My Wheeler trigger gauge indicated that the Franchi’s trigger broke at 3.5 pounds from the factory, and it was smooth and crisp. The Momentum is a shooter for sure, with two out of three loads averaging less than an inch at 100 yards. The budget bolt gun wars have made it nigh inexcusable for any rifle manufacturer to sell a gun costing more than $500 without offering some type of accuracy guarantee. 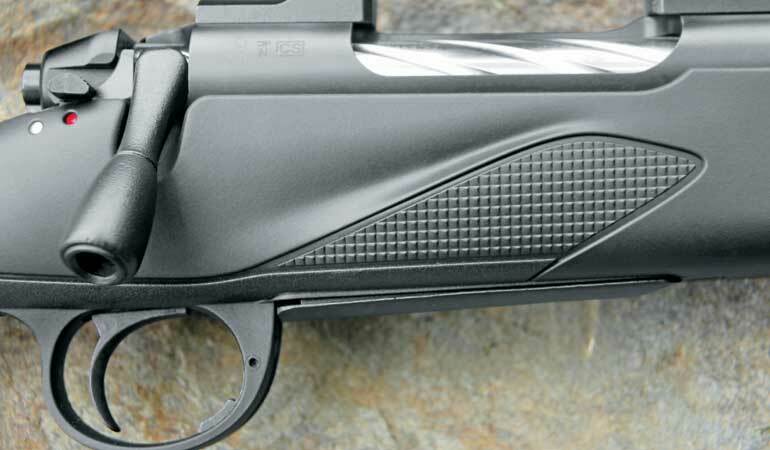 Franchi promises the Momentum will shoot under an inch for three shots at 100 yards, which is quickly becoming the standard by which hunting rifles are judged, and the test group included with the rifle showed a printed group of 0.91 inch. As it turns out, the Momentum can perform even better than that when you find a production load this rifle likes particularly well. Of the three factory rounds tested, the Momentum proved to be most accurate with Federal’s new 175-grain Edge TLR load, which produced a test-best group of 0.47 inch and another group of 0.68 inch for an overall average of 0.71 inch for the three-shot test. Barnes’ 168-grain VOR-TX TTSX lead-free load did almost as well, averaging 0.89 inch. Although I did have to master the technique for loading the cartridges into the internal box magazine quickly and precisely, once the cartridges were neatly stacked in place, there were no issues with feeding, extraction or ejection. The smooth feed ramp shucks the cartridges into place, and after firing, the small extractor and plunger-type ejector dutifully spat out spent cartridges. Most budget bolt guns will produce good groups at 100 yards, but I’ve had some that didn’t always properly cycle ammunition. This wasn’t the case with the Franchi. Overall, the Franchi is a very well-thought-out rifle. The recessed sling studs offer a low-profile design that won’t hang up on gear and gun racks, yet they offer plenty of space for mounting a standard sling. I did find myself taking advantage of the cutout on the bottom side of the buttstock near the recoil pad and the raised texturing ahead of the magazine well, and the two-position safety that allows for loading and unloading in the safe position is a simple yet effective design. There are clear red and white position indicator dots on the right side of the rifle. Even the large rocker-type bolt release is easy to find and operate. There are four variants of the rifle currently available: standard version with a black synthetic stock, with or without a threaded muzzle (I’ve come across two shooters who’ve said they don’t intend to buy a muzzle device and wish all new rifles didn’t come with a threaded muzzle cap); a scoped version that comes with a Burris 3-9x40 mounted and bore sighted; and a Franchi 150th anniversary limited-edition model with an AA-grade satin walnut stock and a non-threaded muzzle. Suggested retail prices range from $609 for the standard rifle to $1,069 for the 150th anniversary rifle. It’s difficult to say what makes one budget rifle a success while another fails. Quality and accuracy are certainly paramount, but there have been a lot of well-built bolt guns that shoot quite well but haven’t caught the eye of wide swaths of the American shooting public. Price is a critical point for many shooters, and while the Momentum costs a bit more than some other budget rifles with a one m.o.a. guarantee, the Franchi’s styling and build quality are superior to many other entry-level guns. The rifle’s weight is just about right, light enough for stalking and heavy enough to manage recoil, and the quirky design elements in the stock function as advertised, though you’ll have to be the judge of whether or not they’re to your taste. And unlike other affordable rifles, even those with an accuracy guarantee, the Momentum doesn’t have to be coaxed into producing groups that meet the minimum accuracy standard. Some of the budget guns will shoot an inch, but not much better—and only with a single premium load or two. If you want to glean significantly better accuracy from a factory rifle with factory ammo than the Momentum produces, you’re probably going to have to start shopping for bolt guns in the four figures. It’s built right, it has a good trigger, and it lives up to Franchi’s consistently high manufacturing standards as a solidly built, relatively affordable hunting arm. Truth be told, I was pulling for this gun from the start. I’ve really been impressed with the shotguns Franchi has been churning out of late, and I hoped its entry into the world of rifles was a serious take on the platform. Will the Italian gun manufacturers make a run at the bolt-action market the way they did at the semiauto shotguns? That remains to be seen. But this rifle lives up to the hype and is worth a hard look if you’re in the market for an affordable turnbolt hunting rifle.